Yehovah, this latecomer in the rendering of our Creator’s Name, has gained popularity within the Messianic and Hebrew Roots communities. However, there are serious linguistic flaws with this pronunciation. Before discussing those, however, it’s important to understand the premise of those who advocate “Yehovah.” This rendering is based on late medieval Hebrew manuscripts of the Old Testament that show the four letters yod-hey-waw-hey [hwhy] with the vowel points from Adonai. Within these manuscripts or codices there are several instances where the vowel points for “Yehovah” (English, “Jehovah”) are found. Based on this fact, it is theorized that the scribes who produced these manuscripts accidentally preserved the name “Yehovah” by not removing the vowel points. There are serious flaws with this hypothesis and logic as you will soon see. Every letter must have sufficient white space surrounding it. If one letter touches another in any spot, it invalidates the entire scroll. If a single letter is so marred that it cannot be read at all, or resembles another letter (whether the defect is in the writing, or the result of a hole, tear or smudge), the entire scroll is invalidated. Each letter must be sufficiently legible so that even an ordinary schoolchild could distinguish it from other, similar letters. A Torah Scroll in which any mistake has been found cannot be used, and a decision regarding its restoration must be made within 30 days, or it must be buried. Considering these extraordinary measures, it is unfathomable that a scribe would leave the same mistake multiple times in a Hebrew manuscript of the Old Testament. The logic that “Yehovah” arose due to Jewish scribal mistakes is seriously flawed. No scholar would accept this explanation. So how do we explain the instances where the vowel points for “Yehovah” are found in these ancient Hebrew codices? 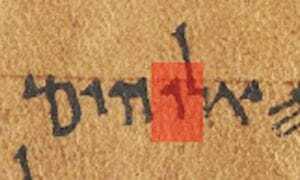 According to biblical scholars, following a Jewish tradition beginning after the 6th century BCE, The Masoretes, i.e., Jewish scribes from the 6-10th centuries CE, used an orthographic device known as Qere / Ketiv to conceal the name. Qere means, “what is read,” and ketiv means, “what is written.” It is found in existing Masoretic manuscripts dating to the 9th and 10th centuries, CE. There are several forms of Qere / Ketiv, including: ordinary, vowel, omitted, added, euphemistic, split, and qere perpetuum. The ketiv that is most relevant is the vowel qere. In this this case, the consonants are unchanged, but different vowel signs are added and only the qere, i.e., what is read, is vocalized. The most notable example of this is with the Tetragrammaton or the four letters of the divine name. To ensure that the name was not pronounced, Masoretic Jewish scribes left the Hebrew consonants, but added the vowel points from Adonai, and on occasions Elohim. 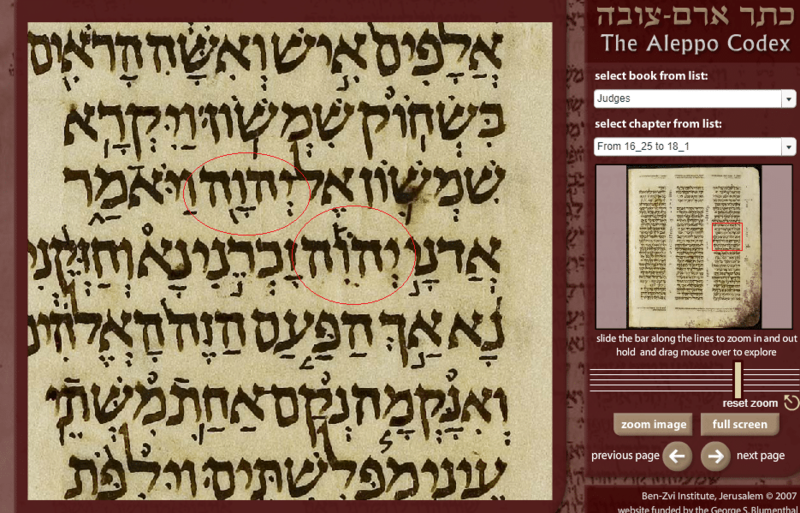 Following the Qere / Ketiv, the reader was to read Adonai or Elohim, depending on the vowel points used. It was never the intent of the scribes that the reader pronounce the vowel points with the consonants. 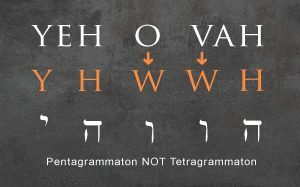 Not realizing this, early translators of the Hebrew Bible transliterated the Tetragrammaton as “Jehovah.” Once scholarship realized that this was never the intent of the Hebrew text, they noted the mistake. Today, there are some who either don’t understand the Qere / Ketiv system or who are actively trying to mislead people by insisting that the pronunciation is Yehovah. However, as nearly all Hebrew scholars acknowledge, this name arose through a deliberate modification in the Hebrew text following a tradition of not pronouncing the Tetragrammaton, as noted by the below references. “After the Babylonian Exile (6th century BCE), and especially from the 3rd century bce on, Jews ceased to use the name Yahweh for two reasons. As Judaism became a universal rather than merely local religion, the more common noun Elohim, meaning ‘God,’ tended to replace Yahweh to demonstrate the universal sovereignty of Israel’s God over all others. At the same time, the divine name was increasingly regarded as too sacred to be uttered; it was thus replaced vocally in the synagogue ritual by the Hebrew word Adonai (‘My Lord’), which was translated as Kyrios (‘Lord’) in the Septuagint, the Greek version of the Hebrew Scriptures,” Encyclopedia Britannica. According to the Jewish Encyclopedia (1901 version) and the Babylonian Talmud, after the death of Simeon the Just, 290 BCE, the Jews stopped pronouncing the Holy Name. The Babylonian Talmud states, “Tosaf Sotah 38a suggests that the Ineffable Name could be pronounced only when there was some indication that the Shechinah rested on the Sanctuary. When Simeon the Righteous died, with many indications that such glory was no more enjoyed, his brethren no more dared utter the Ineffable Name,” Yoma 39b, footnote, p. 186. As confirmed by the Jewish Talmud, hundreds of years before the birth of Yahshua the Messiah the Jews stopped pronouncing the divine Name and began concealing it by reading the vowel points from Adonai into the Tetragrammaton. The motivation behind this practice was not from irreverence but through a strong veneration for the Name. They were afraid that if it were pronounced, someone might misuse or blaspheme the Name. Part of this hesitation doubtless arose from their time in Babylon. While their reasoning was admirable, it is against the clear teachings of Scripture. The Bible confirms the use of the Divine name in both the Old and New testaments, e.g. Genesis 12:8; 13:4; Exodus 3:15; Acts 2:21; and Romans 10:13. Clearly, our Heavenly Father’s Name was used by all believers. Additionally, the Bible states we’re to bless (Psalm 145:21), call (Psalm 80:18; 99:6; Isaiah 12:4), confess (2Chonicles 6:24-25; 1Kings 8:35-36), declare (Exodus 9:16; Psalm 22:22; John 17:26; Romans 9:17; Hebrews 2:12), exalt (Psalm 34:3); glorify (Psalm 86:9, 12), honor (Psalm 66:2), magnify (2Samuel 7:26), praise (2Samuel 22:50; Psalm 69:30), remember (Exodus 3:15; Psalm 45:17), sing (Psalm 68:4), and trust (Isaiah 50:10) in His Name. “In the early Middle Ages, when the consonantal text of the Bible was supplied with vowel points to facilitate its correct traditional reading, the vowel points for Adonai with one variation – a sheva (short ‘e’) with the first yod [Y] of YHWH instead of the hataf-patah (short ‘a’) under the aleph of Adonai – was used for YHWH, thus producing the form YeHoWaH. When Christian scholars of Europe first began to study Hebrew they did not understand what this really meant, and they introduced the hybrid name ‘Jehovah’” (Encyclopedia Judaica, vol. 7, p. 680). “The Tetragrammaton or Four-Lettered Name…which occurs 6,823 times, is by far the most frequent name of God in the Bible. It is now pronounced ‘adonai; but the church father Theodoret records that the Samaritans pronounced it as (Iabe), and Origen transcribes it as (Iae), both pointing to an original vocalization yahveh [The waw yields a ‘w’ sound, not a ‘v’]” (The Universal Jewish Encyclopedia, vol. 5, p. 6). “Jehovah, modern form of the Hebrew sacred name of God, probably originally ‘Yahweh.’ From c.300 B.C. the Jews, from motives of piety, uttered the name of God very rarely and eventually not at all, but substituted the title ‘Adonai,’ meaning ‘Lord,’ the vowels of which were written under the consonants of ‘Yahweh.’ In the Middle Ages and later, the vowels of one word with the consonants of the other were misread as Jehovah” (The Collegiate Encyclopedia, vol. 9, p. 580). “Jehovah….What has been said explains the so-called qeri perpetuum, according to which the consonants of Jehovah are always accompanied in the Hebrew text by the vowels of Adonai except in the cases in which Adonai stands in apposition to Jehovah: in these cases the vowels of Elohim are substituted. The use of a simple shewa in the first syllable of Jehovah, instead of the compound shewa in the corresponding syllable of Adonai and Elohim, is required by the rules of Hebrew grammar governing the use of Shewa” (The Catholic Encyclopedia, vol. VIII, p. 329). “Jehovah, an erroneous pronunciation of the name of the God of Israel in the Bible, due to pronouncing the vowels of the term ‘Adonay,’ the marginal Masoretic reading with the consonants of the text-reading ‘Yahweh,’ which was not uttered to avoid the profanation of the divine name of magical or other blasphemous purposes. Hence the substitution of ‘Adonay,’ the ‘Lord,’ or ‘Adonay Elohim,’ ‘Lord God.’ The oldest Greek versions use the term ‘Kurios,’ ‘Lord,’ the exact translation of the current Jewish substitute for the original Tetragrammaton Yahweh. The reading ‘Jehovah’ can be traced to the early Middle Ages and until lately was said to have been invented by Peter Gallatin (1518), confessor of Pope Leo X. Recent writers, however, trace it to an earlier date; it is found in Raymond Martin’s Pugeo Fidei (1270)” (Encyclopedia Americana, vol. 16, p. 8.). “The personal name of the [El] of the Israelites …The Masoretes, Jewish biblical scholars of the Middle Ages, replaced the vowel signs that had appeared above or beneath the consonants of YHWH with the vowel signs of Adonai or of Elohim. Thus the artificial name Jehovah (YeHoWaH) came into being” (Encyclopaedia Britannica, Yahweh, Micropedia, vol. 10). “In the Hebrew Bible the Jews wrote the consonants of the Tetragrammaton as YHWH, but out of reverence for the sacred name of God (or out of fear of violating Exod. 20:7; Lev. 24:16), they vocalized and pronounced it as Adonai or occasionally as Elohim. It is unfortunate, then, that the name was transliterated into German and ultimately into English as Jehovah (which is the way the name is represented in the American Standard Version of 1901), for this conflate form represents the vowels of Adonai superimposed on the consonants of Yahweh, and it was never intended by the Jews to be read as Yehowah (or Jehovah)” (The Making of a Contemporary Translation, p. 107). “Jehovah in that form was unknown to the ancient Israelites. In fact, Hebrew scholars say that Jehovah would have been impossible according to the strict principles of Hebrew vocalization. The God of Israel was known by a name approximately rendered into English as Yahweh,” (A Book About the Bible, George Stimpson, p. 247). “Although the meaning of the name remains subject to debate, Yahweh is most likely a verbal form of Heb. haya (perhaps originally hwy)…Because of the utmost sanctity ascribed to the name, Jews from postexilic times on have declined to pronounce it in public reading, and only the consonants were written (YHWH; the Dead Sea Scrolls use the archaic, ‘paleo-Hebrew’ script). Although the original pronunciation was thus eventually lost, inscriptional evidence favors yahwae or yahwe. The name is represented in the MT by the consonants with the vowel pointing for ‘adonay ‘Lord.’ From this derived ca, the sixteenth century the form ‘Jehovah’ (yehowah). In modern usage pious Jews often substitute the expression has-sem ‘the Name,” (The Eerdmans Bible Dictionary, Allen C. Myers, Ed., “Yahweh,” p. 1075). “The scribes reasoned that if they did not point the name Yahweh then it could never be treated lightly since his name would not really be known. Initially the real pointing was probably passed along by tradition, but in time it was lost. In Exodus 20:7 the name Lord is written in capital letters according to the convention of signifying the name Yahweh, but the name as it appears in the Hebrew text is hwhy (yehowa), in which appear the consonants from the name Yahweh (hwhy [yhwh]) and the vowels from the word Lord (ynda [‘idonay]). Proof for the fabricated nature of this word are the two vowels which appear on the waw, an impossibility in Hebrew. However, until the revival of the Hebrew language in western Europe scholars read the consonants YHWH (Germans would read them as JHVH) with the vowels of ‘adonay, thereby originating the incorrect form Jehovah. This word was then introduced into English by William Tyndale and was continued by the King James Version,” (The Journey from Texts to Translations, Paul D. Wegner, pp. 172-173). “While it is almost if not quite certain that the Name was originally pronounced ‘Yahweh,’ this pronunciation was not indicated when the Masoretes added vowel signs to the consonantal Hebrew text. To the four consonants YHWH of the Name, which had come to be regarded as too sacred to be pronounced, they attached vowel signs indicating that in its place should be read the Hebrew word Adonai meaning ‘Lord’…The ancient Greek translators substituted the word Kyrios (Lord) for the Name. The Vulgate likewise used the Latin word Dominus. The form ‘Jehovah’ is of late medieval origin; it is a combination of the consonants of the Divine Name and the vowels attached to it by the Masoretes but belonging to an entirely different word… reasons the Committee has returned to the more familiar usage of the King James Version… the word ‘Jehovah’ does not accurately represent any form of the Name ever used in Hebrew,” (Revised Standard Version, Preface, pp. iv-v). “The probable pronunciation of the OT four-lettered word YHWH, the most profound and sacred of the Hebrew names for God. The name is interpreted in Ex. 3:14 as ‘I am who I am.’ The name was held in such high regard that the Jews were forbidden to pronounce it and read the word ‘Adonai’ (i.e., lord) instead. When the Hebrew masoretes added the vowel points to the consonantal text, they used the vowels of Adonai with the four consonants YHWH; this was transliterated in the early versions as Jehovah. This form of the word became quite popular, but it should be remembered that such a word never existed,” (The Encyclopedia of the Lutheran Church, “Yahweh,” Vol. N-Z, p. 2537). “Why not in the form ‘Jehovah’? Is that not euphonious? It is, without question. Is it not widely used? It is, and may still be freely employed to assist through a period of transition. but is it not hallowed and endeared by many a beautiful hymn and many a pious memory? Without doubt; and therefore it is with reluctance that is here declined. But why is it not accepted? There it is–familiar, acceptable, ready for adoption. The reason is, that it is too heavily burdened with merited critical condemnation–as modern, as a compromise, as a ‘mongrel’ word, ‘hybrid,’ ‘fantastic,’ ‘monstrous.’ The facts have only to be known to justify this verdict, and to vindicate the propriety of not employing it in a new and independent translation. What are the facts? And first as to age. ‘The pronunciation Jehovah was unknown until 1520, when it was introduced by Galatinus; but was contested by Le Mercier, J. Drusius, and L. Capellus, as against grammatical and historical propriety.’ Next, as to formation. ‘Erroneously written and pronounced Jehovah, which is merely a combination of the sacred Tetragrammaton and the vowels in the Hebrew word for Lord, substituted by the Jews for JHVH, because they shrank from pronouncing The Name, owing to an old misconception of the two passages, Ex. 20:7 and Lev. 24:16…To give the name JHVH the vowels of the word for Lord [Heb. Adonai] and pronounce it Jehovah, is about as hybrid a combination as it would be to spell the name Germany with the vowels in the name Portugal – viz., Gormuna. The monstrous combination Jehovah is not older than about 1520 A.D.’ From this we may gather that the Jewish scribes are not responsible for the ‘hybrid’ combination. They intentionally wrote alien vowels–not for combination with the sacred consonants, but for the purpose of cautioning the Jewish reader to enunciate a totally different word, viz., some other familiar name of the Most High,” (The Emphasized Bible, [Joseph Bryant Rotherham], Introduction, p. 23-25). “‘Jehovah’ is the best known English pronunciation of the divine name, although ‘Yahweh’ is favored by most Hebrew scholars. The oldest Hebrew manuscripts present the name in the form of four consonants, commonly called the Tetragrammaton (from Greek te∙tra-, meaning ‘four,’ and gram’ma, ‘letter’). These four letters (written from right to left) are hwhy and may be transliterated into English as YHWH (or, JHVH),” (Insight on the Scriptures, Vol. 2, p. 5: “Jehovah,” Watchtower Bible and Tract Society, 1988). The above sources all confirm the fact that “Yehovah” or “Jehovah” arose from scribal additions to the Hebrew text. They added the vowel points from Adonai to the Tetragrammaton. Those who state that the name Yehovah is based on Hebrew manuscripts neglect to realize this crucial fact. The debate of Yehovah is not whether this name is found in Hebrew manuscripts, but how the name arose within these manuscripts. As scholarship overwhelmingly verifies, the name Yehovah arose from willful and deliberate alterations to the Hebrew text by Jewish scribes. For this reason, those promoting this name are simply following an old Jewish superstition designed to conceal the true name of our Creator, Yahweh! A Late Rendition – Evolution of Je(ho)vah by the Masoretes. From the book Pronunciation of the Tetragrammaton: A Historico-Linguistic Approach, we find this interesting scholarly explanation regarding the progression of the name Jehovah and the evolution of the “ho” sound from early Masoretic (Ben Asher) Manuscripts to the later Medieval Manuscripts. “Both Paul Kahle and Peter Katz believed Jehovah to have originated with a combination of vowels of ‘adhonay and shema’ with the consonants of the Tetragrammaton. Dr. Reisel concurs: ‘The sewa under the yod is in my view connected with the pronunciation shema (rendering for yhwh), from which the spelling yehouah < yehwah was derived, under the partial influence of ‘dhny.’ In early Masoretic (Ben Asher) MSS the common vocalization of the Tetragrammaton is yehwah in later (Medieval) MSS we find yehouah. This is the reason why many scholars view Jehovah (Yehovah) as an unnatural, artificial construction. 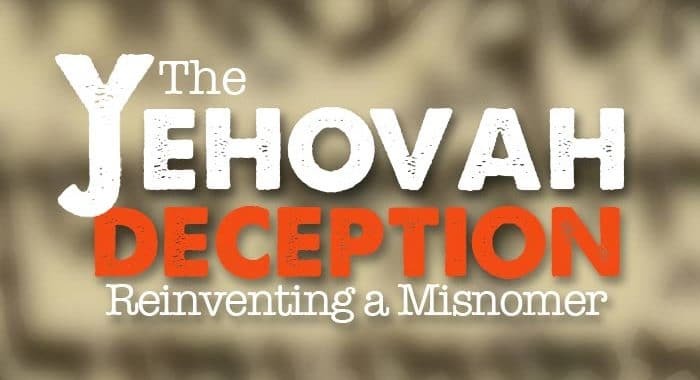 Such arguments against the Jehovah-pronunciation would become null and void if it could be traced back to early North Israelite usage.” And this is the problem we see. Yehovah lacks any ancient manuscripts before the Masoretic times to back it up. The preponderance of ancient evidence clearly shows it must be discounted as a viable pronunciation. The above citation was sent to Professor Fassberg, Ph.D., at the Hebrew University of Jerusalem and he concurred that the explanation was correct based on Hebrew grammar (for additional information on Professor Fassberg, see section “Waw or Vav?”). Once a person realizes this fact, the argument that Yehovah does not contain the vowel points from Adonai is simply false. The hataf patakh (compound shwa) found under the aleph of Adonai and missing from the yod of Yehovah is the result of Hebrew grammar. Those who state otherwise in defense of Yehovah are not understanding the mechanics of the Hebrew language. Those who argue that the vowels for Yehovah have no relation to Adonai have some explaining to do. Within the Leningrad codex and the Aleppo codex (see image below) is it merely coincidence that when the Tetragrammaton is preceded by Adonai, it receives different pointing? 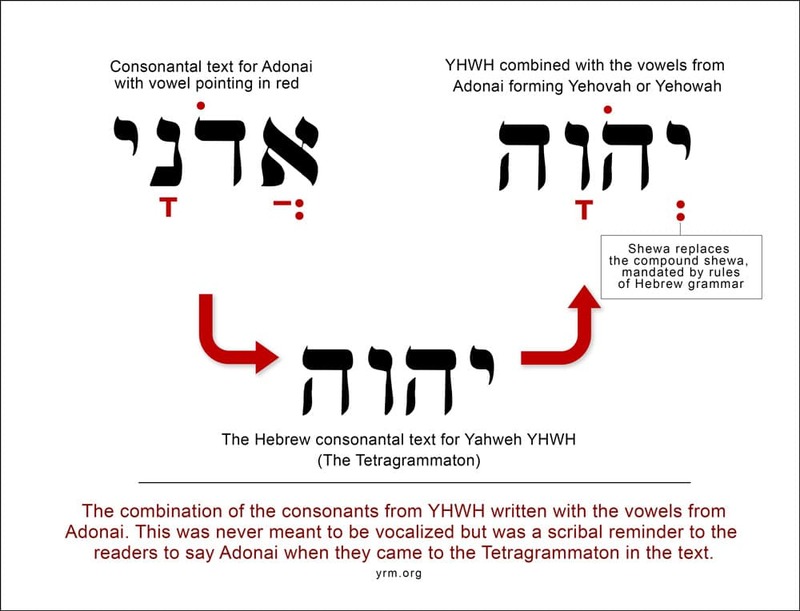 If Yehovah contains the proper and correct vowels, then why do we see the pattern of inserting the vowels for Elohim in the Tetragrammaton when Adonai proceeds it? This is a serious dilemma for the Yehovah proponents and clearly proves a redundant pattern. This is one of those elementary concepts that slips past the unlearned but is well understood in scholarship. As seen (on p. 15) in the Aleppo Codex in Judges 16:28, the name YHWH appears twice with two different sets of vowel points with the approximate renderings “Yehwoh” and “Yehohiw.” “Yehwoh” derives from the vowel points of Adonai and “Yehohiw” derives from the vowel points of Elohim. When the word Adonai was in close proximity in the text to YHWH, the Jews added the vowel points from Elohim to YHWH, indicating the reader was to read “Elohim.” This was to reduce redundancy with the Hebrew Adonai. Strong’s OT:3069 explains this process: “Yehovih (yeh-ho-vee’); a variation of OT:3068 [used after OT:136, and pronounced by Jews as OT:430, in order to prevent the repetition of the same sound, since they elsewhere pronounce OT:3068 as OT:136]” (for clarification, OT:136 correspondents to “Adonai” and OT:430 to “Elohim”). According to the Englishmans Concordance, OT:3069 is found a total of 615 times in the Hebrew Old Testament. Those who support Yehovah do so entirely on the vowel points added by the Masoretes. However, as we find in the Leningrad and Aleppo codices, along with many others, there are several different renderings for the Tetragrammaton. How it is possible to reconcile that the Jews both preserved the name Yehovah and explain why they introduced these alternate Hebrew spellings? Those who believe that Yehovah is the correct pronunciation, their only recourse would be to state that these other spellings were mistakes. However, based on the Talmud, the thought of a Jewish scribe making such a mistake, especially to the Divine name, is unthinkable. Jewish scribal rules required that if a Torah Scroll was found to contain any mistakes it could not be used, unless the mistake was resolved within 30 days. If not, the scroll was to be buried. Knowing this, even if these alternative pronunciations were mistakes, to believe that they were all missed and allowed to remain in the text is incredulous. 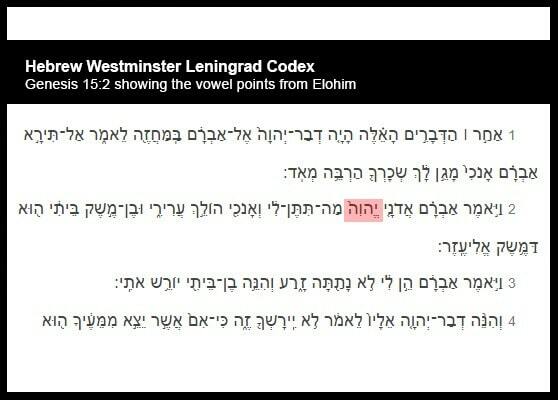 The other explanation is that the Jews willfully concealed the name with the vowel points from Adonai (as seen in Genesis 2:4 within the Leningrad codex) and Elohim (as seen in Judges 16:28 of the Leningrad and Aleppo codices). Considering the implausibility that the Jews overlooked these alternative spellings, the only logical conclusion is that they were aware and added the vowel points to instruct the reader not to pronounce the Divine name and replace it with the words “Adonai” and “Elohim.” As a side note, the Masoretes would often add the vowel points from Elohim to YHWH when the Tetragrammaton preceded the word “Adonai.” This was to reduce redundancy within the text. Another linguistic impossibility with Yehovah is the use of the “v.” While some who support Yehovah will state that the sixth letter of the Hebrew alphabet was originally a “vav” and not a “waw,” pronounced as a “v” and not a “w,” most Hebrew scholars disagree. According to some linguists, the Hebrew vav arose from Ashkenazi Hebrew, which was influenced by the Germanic language. As noted by Menahem Mansoor, Sephardi is older than Ashkenazi and closest to biblical Hebrew. Unlike Ashkenazi, Sephardic and Yemenite Hebrew were never influenced by the Germanic language and therefore maintained a closer resemblance to ancient Hebrew. In addition, J.D. Wijnkoop,. literary candidate in the University of Leyden and rabbi of the Jewish Congregation in Amsterdam, states in his book, Manual of Hebrew Grammar, “Waw is a softly, scarcely audible pronounced w, which is produced by a quick opening of the lips,” (Forgotten Books, Classic Reprint Series, 2015, p. 3, original publication 1898). Dr. Steven Fassberg, who received his Ph.D. from Harvard and teaches at the Hebrew University of Jerusalem as a professor in the Hebrew language department, also confirms the use of the waw and the erroneous nature of Yehovah. He states, “The pronunciation you mentioned [i.e., Yehovah] is a mistake. The Hebrew consonantal text is YHWH and no one really knows how that was pronounced in Old Testament times. At a later date (the latter half of the 2nd millennium CE) Masoretes added vowel signs to the consonantal text. Whenever the Tetragrammaton was written, they added the vowel signs of the word ‘Adonay,’ which means ‘My Lord’ – there was a taboo on pronouncing the Divine name and one was supposed to read the word ‘Adonay – my Lord.’ Much later some started reading the vowel signs together with YHWH and came up with the nonsensical word Jehovah. “There is no doubt that the original sound was w and not v. Sometime during the history of the Hebrew language there was a shift from w > v in pronunciation, probably already during the Mishnaic Period” (email correspondence). The Language of the Bible, 87-104 in Zipora Talshir, ed., The Literature of the Hebrew Bible: Introductions and Studies. Jerusalem: Yad Ben-Zvi Press, 2011 (in Hebrew). He also explains that while the Jews combined the vowel points with the Divine name, the Jews were to read Adonai. Only later did some Jews incorrectly begin reading the vowel points with “YHWH,” phonetically enunciating Yehovah. Ironically, those who support Yehovah today are not only following a long-standing rabbinic tradition of concealing the Name, but doing so incorrectly based on the initial Jewish practice. However, even with such overwhelming evidence, there is one popular teacher within the Messianic community who attempts to support the use of the vav by stating that the waw arose through Arabic influence. While he states that this was confirmed by a “top expert,” he fails to identify this person. It should also be noted that Hebrew is far older than Arabic. According to scholars, the Arabic language does not predate the 4th century CE. The thought of a newer language influencing a pre-existing language in such a way is illogical. This person also states that the vav can be verified from a 6th century CE Hebrew poet Eleazar ben Killir. According to Professor Fassberg, the “v” as it pertains to vav, can be be verified by the Mishnaic Period (1st to 3rd century CE, see below). Therefore, knowing that the “v” existed by the 3rd century CE, it should not be a surprise to find a Hebrew document from the 6th century CE using the “v.” These co-called proofs for a “v” sound for the Hebrew waw is nothing but smoke and mirrors and contrary to the preponderance of scholarship. Additional waw as found in Dead Sea Scrolls, but replaced with the holam in Masoretic codices. There’s another issue with Yehovah and that is the use of the “o.” This letter derives from the holam, the vowel point that sits above the waw within the Masoretic manuscripts. The issue with this letter is that it’s not supported by the Dead Sea Scrolls. In many cases, when a holam appears in the Masoretic documents, the Dead Sea Scrolls reflect this sound through the use of the letter waw, which in biblical Hebrew was used as both a vowel and consonant. An example of this can been seen with the Hebrew elohim in Psalms 138:1. In this instance, the Dead Sea Scrolls contain an additional waw, which is replaced with the holam in the Masoretic codices. With this in mind, we should anticipate seeing an additional waw in the Tetragrammaton in some of the instances of the Dead Sea Scrolls. Surprisingly, though, there are no instances where the Tetragrammaton contains a second waw to reflect the “o” within the Dead Sea Scrolls. This lack of evidence strongly suggested that the holam or “o” within Yehovah is a recent addition. This is one more piece of evidence confirming that Yehovah is a counterfeit. Flavius Josephus, the prominent Jewish historian who lived between 37 – 100 CE, also attests to the use of the waw or “w” within the Hebrew language. In describing the High Priest’s mitre or turban, he writes, “A mitre also of fine linen encompassed his head, which was tied by a blue ribbon, about which there was another golden crown, in which was engraven the sacred name: it consists of four vowels,” The Wars Of The Jews, Book 5, chapter 5, paragraph 7. Vowels are spoken with an open mouth, allowing unobstructed air flow, and consonantal sounds are produced with the mouth fairly or partially closed. We can see that in such consonants as v, f, s, and z, the airflow is obstructed and the sound is made by squeezing the air through a narrow space. While “v” is considered a consonant, “w” can be both a vowel and consonant and categorized as a semi-vowel. The Standard American Encyclopedia states, “W represents two sounds: 1) The distinctive sound properly belonging to it is that which it has at the beginning of a syllable, and when followed by a vowel, as in was, will, woe, forward, housework, etc. ; 2) at the end of syllables, in which position it is always preceded by a vowel, it has either no force at all (or at most only serves to lengthen the vowel), as in law, paw, grow, lawful; or it forms the second element in a diphthong, as in few, new, now, vow, in such cases it is really a vowel,” Vol. XIV, “W,” 1940. “The true pronunciation of the name YHWH was never lost. Several early Greek writers of the Christian Church testify that the name was pronounced ‘Yahweh’” (Encyclopaedia Judaica, vol. 7, p. 680). “Early Christian writers, such as Clement of Alexandria in the 2nd century, had used the form Yahweh, thus this pronunciation of the Tetragrammaton was never really lost. Greek transcriptions also indicated that YHWH should be pronounced Yahweh” (Encyclopedia Britannica, 15th ed., vol. x, p. 786). “The pronunciation Yahweh is indicated by transliteration of the name into Greek in early Christian literature, in the form iaoue (Clement of Alexandria) or iabe (Theodoret; by this time Gk. b had the pronunciation of v)…Strictly speaking, Yahweh is the only ‘name’ of God. In Genesis wherever the word sem (‘name’) is associated with the divine being that name is Yahweh” (Eerdman’s Bible Dictionary, 1979 p. 478). “Such a conclusion, giving ‘Yahweh’ as the pronunciation of the name, is confirmed by the testimony of the Fathers and gentile writers, where the forms IAO, Yaho, Yaou, Yahouai, and Yahoue appear. Especially important is the statement of Theodoret in relation to Ex. lvi., when he says: ‘the Samaritans call it [the tetragrammaton] ‘Yabe,’ the Jews call it ‘Aia’…” (The New Schaff-Herzog Religious Encyclopedia, “Yahweh,” p. 471). “I mentioned the evidence from Greek papyri found in Egypt. The best of these is Iaouee (London Papyri, xlvi, 446-483). Clement of Alexandria said, “The mystic name which is called the Tetragrammaton…is pronounced Iaoue, which means, “Who is, and who shall be”’” (Dr. Anson R. Rainy, Biblical Archaeology Review, Sept.-Oct 1994). Dr. Rainy is a professor of Ancient and Near Eastern Cultures and Semitic Linguistics at Tel Aviv University. As confirmed through these references, the pronunciation of Yahweh was preserved in Greek by several church fathers. This included Clement of Alexandria, Origin, and Theodoret. It’s important to realize that these Greek documents contain vowels, ensuring the exact pronunciation, and that they pre-date the Hebrew manuscripts containing the pronunciation “Yehovah” by nearly 700 years. In addition to early church writers, evidence for Yahweh is also found in The Nag Hammadi codices, dating from the 2nd to 4th century CE. 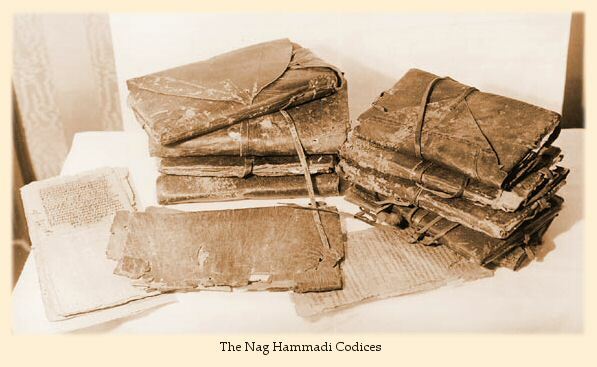 This library of Gnostic writings was discovered in Upper Egypt, near Nag Hammadi, in 1945. In all, there are over 50 texts within this library. Since they are in Greek, as the church fathers, they preserve the pronunciation. One such book is The Secret Book of John. Within this codex, it mentions the name Yahweh and notes, “Eloim and Yawe, two names of God in the Hebrew scriptures…. Yahweh is the name of God (based on the Tetragrammaton, the ineffable four-letter name)” (Dr. Marvin Meyer, The Nag Hammadi Scriptures, p. 127). The Secret Book of John dates to the second century, as it was known to the church father Irenaeus. This was the same timeframe as Clement of Alexandria, who also confirmed the name. Even though Gnosticism was rightly deemed heretical by the early church, it is another witness to the pronunciation of Yahweh. The fact that these groups were at odds, but agreed on “Yahweh,” is significant and adds credence to this pronunciation. It verifies that “Yahweh” was widely recognized as early as the second century, nearly 700 years before any Hebrew manuscripts containing Yehovah. Additional evidence for the short form “Yah” may also be found in the Murashu texts dating back to 464 BCE (Aramaic cuneiform scripts on clay tablets) and ancient Egyptian hieroglyphics, containing the first syllable of the Tetragrammaton and corresponding to IA or YA. This may offer additional evidence against the “yeh” in Yehovah. It’s important to note that both of these sources contain vowels, which confirms the “yah” syllable before Jewish vowel pointing. Another strike against the “Yeh” prefix in Yehovah is that we find many Jewish names with the theophoric element “Yah” and “Yahu” dating to 572-477 BCE in Akkadian cuneiform tablets, a language cognate to Hebrew. Examples of such names include: Yahadil, Yahitu, Yahmuzu, Yahuazar, Yahuazza, and Yahuhin. YRM recently contacted several professors through email inquiring about these names and received the following responses. Professor Ran Zadok from the Hebrew University of Jerusalem who specializes in Mesopotamian, Iranian and Judaic Studies, confirmed, “It seems to me that the cuneiform spellings render approximately *Ya(h)w” (see similar rendering on the Dead Sea Scroll fragment below). Professor Martin Worthington from Cambridge who specializes in Mesopotamian languages and literature, states, “…scholarly consensus has it that Yahwistic names are well attested in first-millennium Babylonia. As several scholars have observed, there is a strong tendency (though not an absolute rule) for the form to be yahu at the beginning of the name, and yama at the end of the name (though yama is actually yawa, since in this period intervocalic m is usually pronounced w). The cuneiform script does include vowels. The sign IA is a bit of a special case, since it can represent ia, ii, iu or ie. But in this case we also have spellings such as ia-a-hu, showing that the vowel is indeed ‘a’.” For additional study, refer to Documents of Judean Exiles and West Semites in Babylonia in the Collection of David Sofer by Laurie E. Pearce and Cornelia Wunsch. In addition to these sources confirming the short form “Yahw” or “Yaho,” they also suggest that a shift occurred between “Yah” to “Ye” within the prefixes of Jewish names between the Neo-Babylonian and Achaemenid (572-477 BCE) and the Masoretic (6-10 century CE) periods. These names also offer indirect evidence for the prefix “Yah” within the Tetragrammaton and therefore casting doubt on the “Ye” within Yehovah. It’s surprising for some to learn that the short form of the name “Yah” (Yahweh = ee-ah-oo-eh) is found in the Dead Sea Scrolls. 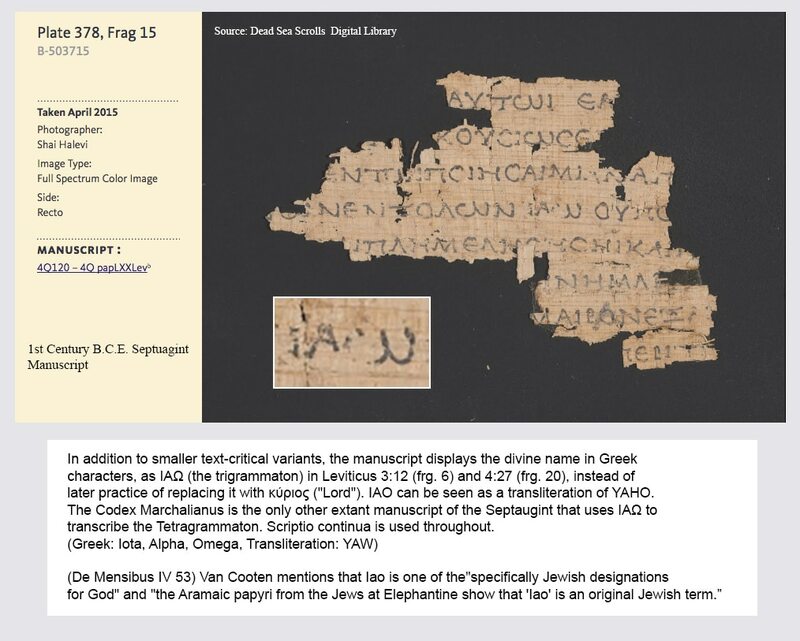 Manuscript 4Q120-4QpapLXXLevb (See below) shows the Greek: Iota, Alpha, Omega, transliteration: YAW or Yahw. This clearly shows that the vowel pointing with “Yeh” is erroneous as it relates to the phonetic pronunciation of the name and supports the scholarly consensus that these vowel markings are a direct result of the later vowel pointing for Adonai added to the Tetragrammaton. It’s rather puzzling to see an attempt to use late manuscripts e.g. Leningrad Codex, Aleppo Codex (both 10 Century C.E. MSS) as proof for Yehovah, but which also have several other renderings like Yehohiw (with the vowels for Elohim inserted) written in the text. Yet, we see in the Dead Sea Scrolls three of the four parts of the Tetragrammaton (Yahw) going back to the 1st Century written in Greek with the vowels preserved. This is over 900 years before the Leningrad and Aleppo codices were written. There are at least two instances where scholars accepted Yehovah but then later retracted their support in favor for Yahweh. After supporting Yehovah in its first edition, the Keil & Delitzsch Old Testament Commentaries removed it from later printings. They stated, “…it must be conceded that the pronunciation Jahve [Yahweh] is to be regarded as the original pronunciation. The mode of pronunciation Jehova [Yehovah] has only come up within the last three hundred years; our own ‘Jahava’ [in the first edition] was an innovation” (Nehemiah to Psalm LXVII, p. 827). Gesenius also initially accepted the Tetragrammaton with the vowel points from Adonai, but then later retracted his support for this hybrid and was noted within Gesenius Hebrew and Chaldee Lexicon, “This opinion Gesenius afterward thoroughly retracted,” p. 337. Upon rejecting Yehovah, he supported the pronunciation Yahweh. Both Keil and Delitzsch and Gesenius, perhaps the most renowned linguistic scholar of his day and even in modern scholarship, rejected the inaccurate form Yehovah in favor of Yahweh. This withdrawal offers additional evidence for the erroneous nature of Yehovah. Let us weigh the evidence for Yehovah and Yahweh. First, we will consider Yehovah. According to a small number of individuals, the name Yehovah is found in Hebrew manuscripts dating back no earlier than the 9th century CE. And while they provide such late Hebrew manuscripts for this conclusion, they have no additional proof to offer. It’s also noteworthy that these manuscripts all include the vowel points or diacritical notes of the Masoretes or Jewish scribes. The same is not true for Yahweh. The name Yahweh is confirmed by church fathers and Gnostic codices dating back to the 2nd century CE, nearly 700 years before Yehovah appears within any Hebrew manuscript. In addition, biblical and linguistic scholarship nearly universally agrees that Yehovah is an erroneous hybrid that arose by adding the vowel points from Adonai to the Tetragrammaton, a point that advocates of Yehovah disagree with, but have no scholarship to rebut. Modern scholarship also overwhelmingly is in agreement with the pronunciation Yahweh. Also, the “w” in Yahweh (Hebrew letter “waw”) is almost unanimously agreed upon by scholars to pre-date the modern “v” or “vav” within Yehovah. Credible biblical Hebrew classes like “Basics of Biblical Hebrew” from Zondervan and many others will teach this as fact in their curriculum. The real issue with Yehovah is not that it doesn’t appear in Hebrew manuscripts of the Old Testament, but how it originated within those manuscripts. Therefore, whether a person claims one or a thousand manuscripts, the result is the same; this hybrid arose from willful and deliberate scribal modifications of the Tetragrammaton due to a belief that this Name was too holy to use, a claim that the Bible clearly refutes. This was done by adding the vowel points from Adonai and Elohim to the four letters of the Creator’s name. While this was done out of reverence for the name, such tampering is not biblically permitted. The Third Command warns of not using Yahweh’s name in vain. One way of using Yahweh’s name in vain is by replacing it with a counterfeit, such as Yehovah. History records the letter W didn’t exist before the 13th-14th century. The letter W replaced the use of VV and UU. The proper name of our Father in heaven is Yahuah. It’s true that the letter “w” was one of the last letters to the added to the English alphabet. However, Yahweh’s Name was not delivered in English, but in Hebrew, before the English language existed. It comes from the four Hebrew letters, yod-hey-waw-hey. In antiquity, the “waw” had a “w” sound. Therefore, it’s irrelevant when the English letter “w” developed. Names are transliterated, meaning the sounds (not the letters) are carried over to another language. No, the first syllable is not Yah. The vowel points make it very clear it is Yeh. I concur and so does Dr. Steven Pigeon, The son of YAHUAH used the Hebrew name YAHUSHA. Both Names are held in the highest esteem and are sacred and divine. The name Ehyeh is actually 3 syllables. It’s Eh-heh-yeh. Based on scholarship, the Father’s Name contains two syllables, not three. The three syllables developed through the Jewish practice of transposing the Father’s Name with the vowel points from Adonai. The form “e-yeh aser e-yeh” is not the father’s Name, but a description of His existence as spoken in first person. I’m sorry I mean the two constants next to one another without a vowel point. I for one am grateful. I was watching a new show the other day and the one hosting the show kept using the name Yehovah. At this point in my life, I had never heard of such a name. My curiosity has been getting the better of me. I am so glad that Yahweh led me to your discussion. I personally believe that you cannot call on the Name of the LORD if you don’t know what His Name is. Once again thank you for solving this problem for me. Hebrew grammar dictates that G-d’s name is three syllables. So right off the bat, Yahweh is incorrect. Secondly, Yehoveh is the correct vocalization of the name, unless your tradition vocalizes the vav as a “w”. In that case it would be Yehoweh. The true pronunciation is Yeh- ho- vuh. There isn’t any debate among Orthdox Jewish scholars. Everyone of them, without fail have verified this although they refused to say it, they had no aversion to me saying it and them agreeing with my pronunciation. Based on scholarship, this is incorrect. Greek inscriptions from early church fathers, along with the Samaritans and Gnostics, all verify the pronunciation of Yahweh. The name “Yehovah” developed through a deliberate effort to conceal the Name by transposing the vowel points of Adonai to the four letters of the Father’s Name. Regarding these “Orthodox Jewish scholars,” how is it possible that they have confirmed “Yehovah” if they are unwilling to pronounce the Name? May you please include the root words of both YAHWEH and Yehova, as far as I have seen, Hova means destruction. Sorry but the only deception is this article. Almost now 100 witnesses to the name Yehovah in both early and later texts…What witnesses do you have for Yahweh? Zero. The Father will get the truth out despite the obstacles you place in the way of His people. May your hearts be softened, and may you be willing to seek out the truth even if it means that you are wrong and the name of your ministry has to change. Shalom. And you keep deleting my comments…That’s okay…the Father knows. If its “Technically” true. Then that would mean, it’s true. 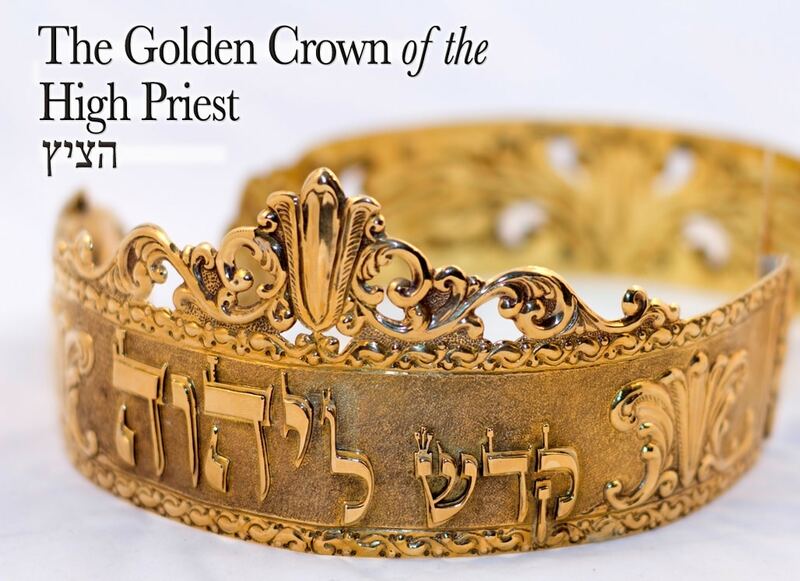 Any person can see the first vowel in adonai and the devine name are….different. People can say IF they do this, or simply change that to this, then it means this other thing. People can reinvent definitions to say anything they want to. Men can claim they are women. Doesn’t mean it’s true. Except to those who want to believe it. Would youplease explain why you think the pronunciation Yehovah is an impossibility? It lloks like there have been document found that date well beyond 1520. I believe I know why there is so much confution on the pronunciation; but I would need to be in person for us to be able to hear the sounds. Type print doesnt do it? YRM: Regarding the time period of the pronunciation Jehovah – 1520 AD. Is this not the same time period of the invention of the letter “J”. The English converted the “I” in Greek to the English “J”, as I understand it. Thus, we have much mischief regarding “times, seasons, etc.” which our adversary will use to misdirect our worship. Shalom family. Thank you for actually reading and considering our side of the conversation. Blessings and Shalom. It’s very comforting and reassuring that being a ”new creation” in Messiah Yeshua the pronunciation of YHWH is recognized by Him, as Daddy. Question – are you yourself fluent in Hebrew and have you read to multitudes of documented commentary from centuries of Rabbis whom specifically verify the validity that Yehovah is indeed the correct pronunciation? Answer me this, why do we see every time the Tetragrammaton was preceded with Adonai the pointing of the Tetragrammaton contains the vowels of Elohim? This is in the Lenengrad and Aleppo codices. I have yet to find one Yehovah proponent rationally explain this phenomenon. I would expect they wouldn’t since Yehovah is a combination of the Nikkud of Adonai. Yahweh or Jehovah? Why it matters and how it impacts your salvation. Nehemia Gordon discovered over 1,000 manuscripts. What do you think? I stopped reading after the first sentence! The vowels of Yehovah are NOT the same as the vowels of Adonai. Period. The name “Yahweh” is a Christian-pagan invention! Yehovah is the proper name of God. Oh, so you found documents dating back before 894 A.D? Did Gesenius state that "Yahweh" and "Jupiter" were related? What is the Qere and Ketiv and how does it relate to the Masoretes? Thanks for your comment Steve, we appreciate your kind words! Yahweh bless you! I came across a website that goes DEEP into linguistics and such showing the solid evidence of the pronunciation as Yahweh. I figured I’d come back and share the link. Maybe it can help you garner more material for your content. This is exactly what people like me that have burnt out there eyeballs studying this topic would, in my opinion, consider a great find. All of the points brought up in the article you linked to are addressed in the article above. The article you provided is simply a regurgitation of Nehemia Gordon’s stance, which we have seen several times. The fact remains, these “ancient” Jewish sources everyone loves to go to are not ancient. They are ALL from the 9th century on. שלום יהוה אליך. Shalom of Yahweh to you.